Florida softshell turtle are freshwater turtles with a distinctive tabular snout and a relatively flat, leathery shell. They live in freshwater habitats with sand bottoms or mud. The turtle ranges on the lower part of the southeastern coastal plain. Florida softshell turtles are omnivorous. Their shells generally are uniform in color and typically are from dark brown to dark green. They have a lifespan of 30 years in the wild and more than 30 in captivity. The life cycle of the Florida softshell starts as an embryo in the egg laid by the female. Females usually lay eggs in clutches on land to enable exchange of oxygen across the shells of the eggs. Eggs laid are oval in shape and are about one inch in diameter. At this stage, development of the embryo proceeds through three stages (organogenesis, tissue development and cells division, and growth of the embryo before hatching), which take a period of 70 days. Hatchlings break through the egg using their front claws. They are about 1-1.25 inches in length and are round in shape. At hatching, hatchlings are independent. They feed on small fish, larvae, aquatic vegetation, snails and other tiny invertebrates. During this stage, the hatchling grows without changing the plastron shape (the belly part of the shell). Hatchling Florida softshell turtles have a round-shaped carapace. With time, their round shape changes to oval through allometric growth. Juveniles are of the same shape as adults. Their soft shells are olive yellowish in color with dark spots that are large and round, with orange and yellow marking on the head. The markings eventually are lost with age. Juveniles are about 3 inches long and remain at this stage until they reach a length of about four inches. At this stage, females exhibit a faster growth rate than males. The rate of growth also depends on the availability of food. The sub-adult stage in Florida softshell turtles varies depending on the sexes. The turtles reach sexual maturity at this stage. Males take four years to become sexually mature. At this age their plastron length ranges between 80 and 85 mm. Females mature sexually during their ninth year, at which time their plastron length is about 140-150 mm. 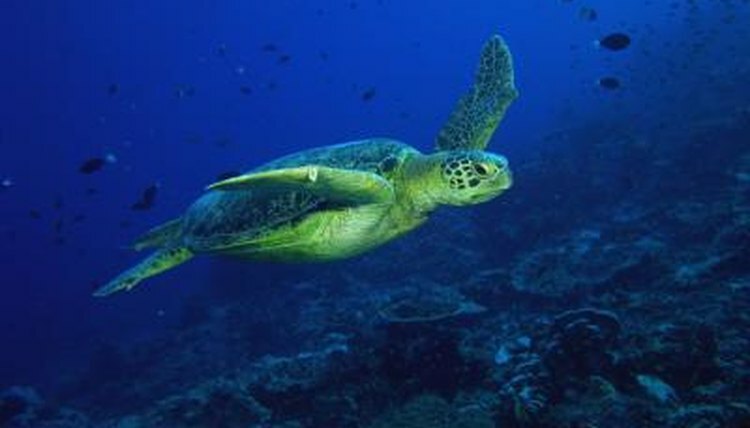 Sub-adult turtles feed on larger prey, such as worms and larger fish. This is the final stage of the Florida softshell turtle’s lifecycle. They have brown-gray shells, and some of the adults have traces of the juvenile markings. Adult males reach 14 and adult females 24 inches in length. Adult females have thinner and shorter tails than males. Turtles at this age feed on birds, rodents, and other large prey items. What Do Snapping Turtles Look Like?